Ground source heat pumps have been around for over 50 years, and are quite common in some parts of the world such as the United States and Scandinavia. Most people don’t realise that they can be a viable option for residential properties however it should no surprise to see them becoming more and more common in the UK, particularly for new build properties. Ground source heat pumps work by harnessing solar heat stored in the ground. Coils are buried in trenches or boreholes beneath your garden and a mixture of water and anti-freeze is pumped through them. This liquid absorbs the ground heat (which is typically around 11 – 13 degrees Celsius even in winter) and it is then fed through a compressor which increases its temperature to a usable level. Is My Property Suitable for a Ground Source Heat Pump? 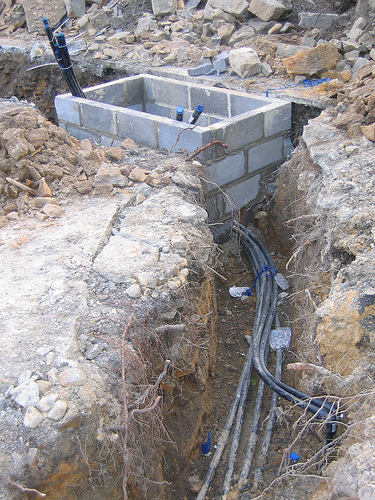 Ground source heat pumps can be installed at most properties. You will need some garden land and if laid in trenches, the coils will take up about twice as much area as the footprint of the house itself. If you do not have enough garden land for this then the coils can be buried vertically, in deep bore holes. To achieve the best results however your property must be well insulated. The water used to heat your property will not reach the temperatures produced by a gas, oil or electric boiler therefore in a poor or even averagely insulated home the energy savings will be greatly reduced and it may be difficult to achieve a comfortable temperature in the colder months. In addition, ground source heat pumps work best with under floor heating, which is often impractical to install in existing buildings. Radiators can be used effectively though they will need to be larger that the traditional kind. As a result, ground source heat pumps are presently best suited to modern, well insulated homes or to new builds, where under floor heating can be easily installed. How Much Heat Will Ground Source Heat Pumps Produce? An “average” house, if there is such a thing, uses around 23,000 kWh of heat per year for heating, cooking and hot water and a good quality heat pump in a well insulated home should be able to produce all of this. Will Ground Source Heat Pumps Produce Heat in Summer? Yes, the temperature of the soil underground remains more or less constant throughout the year and so seasonal changes in weather should not affect the efficiency of a ground source heat pump. As with any heating system however it will obviously have to work harder in the colder months. What is the Renewable Heat Incentive and How Much Could I Receive? The renewable heat incentive (RHI) is a government incentive designed to encourage people to install microgeneration systems, such as ground source heat pumps, in order to reduce the amount of fossil fuels consumed and so help the UK meet its CO2 emissions targets. Under the scheme, homeowners are paid for each kWh of renewable energy they produce. The rate varies depending on the type of technology used, with the greenest technologies receiving the highest rate. The rate for ground source heat pumps is 7p per kWh. The scheme is still in the pilot stage and the details have yet to be clarified however it is envisaged that the payments will be based on estimated rather than metered use. The total amount of energy that your home should use in a year will be calculated based on size and number of occupants etc. What will not be taken into account is how well or poorly insulated, and generally energy efficient, your home is. Instead, a minimum standard will be presumed. The point of this is to encourage people to become energy efficient, as thus get more from the scheme. The average home is said to use around 23,000 kWh of heat per year, so if this were used as the estimate then the annual incentive payment would be around £1,610. Assuming the government do decide to go ahead with the incentive, it is due to commence on 01 April 2011 and in the case of ground source heat pumps will be paid for 23 years. Is Installing Ground Source Heat Pumps Cost Effective? The following is yet to be confirmed and subject to change at the time of writing. 23000 kWh of gas (what is needed to produce heat and hot water for a year for the average home) at current prices would cost around £920. A ground source heat pump producing 4 kWh of heat for 1 kWh of electricity would use around £775 worth electricity per year, so there would be a fuel bill saving of £145 per year. Add the RHI payment of around £1610 to this and you are £1755 per year better off. The system itself will cost between £7,000 – £13,000 to install and so potentially this cost could be covered in about 6 – 8 years. It should be noted that many of these figures or from installers are presumably therefore based on the best case scenario, but the potential is still quite evident. For older homes, a larger, more expensive system will probably be required and it will probably be less efficient, therefore the benefits are harder to see. Nonetheless, the renewable heat incentive should still make it profitable and it is worth bearing in mind that gas prices are likely to rise well above the rate of inflation for the foreseeable future and the closer they get to electricity prices, the more cost effective the ground source heat pump becomes. An important note of caution is needed here however, the RHI was a Labour initiative and, although the current administration is equally (if not more depending on the Lib Dem influence) committed to meeting emissions targets, they have not confirmed whether they intend proceeding with the scheme. What Maintenance Do Ground Source Heat Pumps Need? According to the manufacturers no regular maintenance is required. The system has few moving parts meaning it is less likely to break down. Guarantees are generally available and you should try to get the maximum possible term and ensure that it is insurance backed in the event that the installer ceases trading. How Long Do Ground Source Heat Pumps Last? The manufacturers claim that they will last for more than 25 years. This is much longer of course than a boiler would be expected to last and hopefully, in 25 years time although the RHI payments may well have come to an end the technology should, as tends to be the case with new technologies, have become much cheaper. A really informative post. It’s good to see heat pumps becoming more and more popular in the UK. With people wanting to reduce their carbon footprint and their energy bills this is a great option, especially with the incentives that are available.